3. AVM-450 330 - 512 MHz. 20 MHz. 3 dBi. 4. AVM-850 800 - 990 MHz. 70 MHz. 3 dBi. 7. BVM-100-1000 100 - 1000 MHz. Entire Band 2 to 0dBi. 19. BVM-300-3000 300 - 3000 MHz. Entire Band 2 to 0dBi. 23. BVM-700-2500 700 - 2500 MHz. Entire Band 2 dBi. 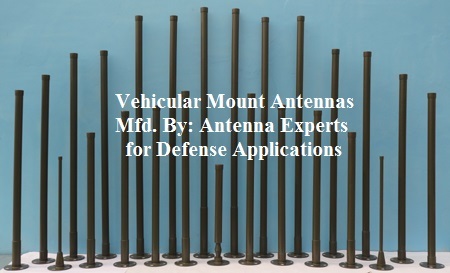 The AVM series vehicle mount antennas are all brass, narroband, light duty antennas and uses base loading technique for smooth impedance matching. Air-cored base loading coil keeps the losses to minimum. These whip mobile vehicle mount antenna comes with a 3.5 Meter long RG-58 coaxial cable with fitted N-Male Connector. Customized length of coaxial cable and connectors can also be supplied with the vehicular mount whip mobile antennas. The VHF UHF ground to air aviation band antennas uses large diameter radiating elements stacked vertically and enclosed in ABS radome. The special “Choke and Spark Gap” technique is used for smooth VSWR and excellent gain over the entire aeronautical military ATC frequency band. The compact size of BVM series broadband omni-directional vehicular mount antenna allows easy handling, shipping and highly suitable for receiving, transmitting, scanning, monitoring and jamming applications without having the requirement of multiple antennas. The BVM series vehicle mount ground to air antenna are broadband, heavy duty and are sealed in UV resistant ABS enclosure for complete weather protection. Cylindrical shell/enclosure is used for low wind loading and for minimal effect of ice formation on the antenna operation as well as providing an aesthetically pleasing appearance. Different mounting option with vehicular mount antenna can be supplied like standard side pole mounting arrangements, roof top hole mounting arrangements or NATO 4 hole pattern with or without spring. Customized mounting arrangements can also be supplied on request. Direct mounting on equipment for manpack application are also available. BVM-100-1000 vehicle mount coaxial dipole antenna is rugged all weather model, enclosed in a ABS radome, uses high class aluminum alloy and does not require any field tuning or adjustments. The special “Choke and Spark Gap” technique is used for smooth VSWR and constant 2 to 0dBi. gain over the entire 100-1000 MHz. frequency band. The UV resistant ABS enclosure has excellent transparency for RF signals and enough strength to withstand specified wind loads. BVM-500-6000 broadband omni-directional vehicle mount coaxial dipole antenna is rugged all weather model, enclosed in a ABS radome, uses high class aluminum alloy and does not require any field tuning or adjustments. The compact size of omni-directional coaxial dipole antenna allows easy handling, shipping and highly suitable for receiving, transmitting, scanning, monitoring, surveillance and jamming applications without having the requirement of multiple antennas. BVM-225-450 Omni-directional UHF ground to air vehicular mount aviation band antenna is rugged all weather model, enclosed in a ABS radome, uses high class brass and aluminum alloy and does not require any field tuning or adjustments. The N-Female termination of antenna is fixed at the bottom of the mounting flange for complete weather protection. Cylindrical shell/enclosure is used for low wind loading and for minimal effect of ice formation on the antenna operation as well as providing an aesthetically pleasing appearance. BVM-118-400 Omni-directional VHF UHF ground to air aviation band antenna is rugged all weather model, enclosed in a ABS radome, uses high class brass and aluminum alloy and does not require any field tuning or adjustments. The N-Female termination of antenna is fixed at the bottom of the mounting flange for complete weather protection. The VHF UHF ground to air aviation band antenna is consisting of large diameter radiating elements stacked vertically and enclosed in ABS radome. We also manufactured BVM-20-100 for 20-100MHz vehicular mount jammer Antenna, BVM-20-500 for 20-500MHz vehicular mount jammer Antenna, BVM-30-512 for 30-512MHz vehicular mount jammer Antenna, BVM-30-88 for 30-88MHz vehicular mount jammer Antenna, BVM-500-2600 for 500-2600MHz vehicular mount jammer Antenna, BVM-2500-6000 for 2500-6000MHz vehicular mount jammer Antenna along with customized design.